A foreign embassy is the official office of one country in the capital of another country. It is where the ambassador (representative) of the home country works and it is where most of the communication (talk) between the two governments happen. A permanent diplomatic mission is typically known as an embassy, and the head of the mission is known as an ambassador, or high commissioner. 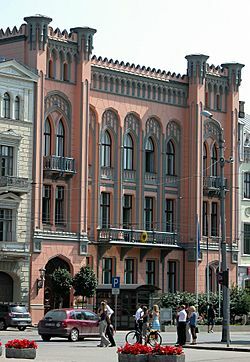 The term "embassy" is commonly used also as a section of a building in which the work of the diplomatic mission is carried out, but, strictly speaking, it is the diplomatic delegation itself that is the embassy, while the office space and the diplomatic work done is called the Chancery. Therefore, the Embassy operates in the Chancery. A diplomatic mission or foreign mission is a group of people from one state or an organisation present in another state to represent the sending state/organisation officially in the receiving state. In practice, a diplomatic mission usually denotes the resident mission, namely the embassy, which is the office of a country's diplomatic representatives in the capital city of another country, whereas consulates are diplomatic missions which are not performed in the capital of the receiving state. As well as being a diplomatic mission to the country in which it is situated, it may also be a non-resident permanent mission to one or more other countries. There are thus resident and non-resident embassies. Some cities may host more than one mission from the same country. 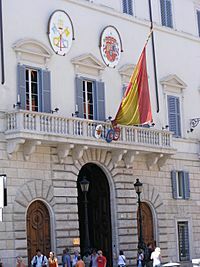 An example is Rome, where many states maintain missions to Italy and another to the Holy See. It is not customary for these missions to share premises nor diplomatic personnel. At present, only the Iraqi missions to Italy and the Holy See share premises; however, two ambassadors are appointed, one to each country. In the case of the UN's Food Agencies, the Head of Mission to the Italian Republic is usually accredited as Permanent Representative. The United States maintains a separate United States Mission to the UN Agencies in Rome whose head is the United States Ambassador to the United Nations Agencies for Food and Agriculture.kolkata,India hosts two Bangladesh deputy high commissions.One at Park Circus and another at Mirza galib street.This was done to reduce overcrowding inside the deputy high commission.At first the park circus was opened and then the mirza galib street one.Now both the deputy high commissions issue Bangladeshi visa. Embassy Facts for Kids. Kiddle Encyclopedia.